It never fails. I'm out Christmas shopping and I come home with a little something for me. Anyone else have that problem? ...given to me by my friend and colleague Shannon. So when I saw these mugs (they're big), I thought our fighting days would be over. However, I was informed that these were too big and our coffee would get cold before we finished it. Boo! But then, the aforementioned husband said these magic words, "I thought you got them to decorate with." Ding, ding, ding! 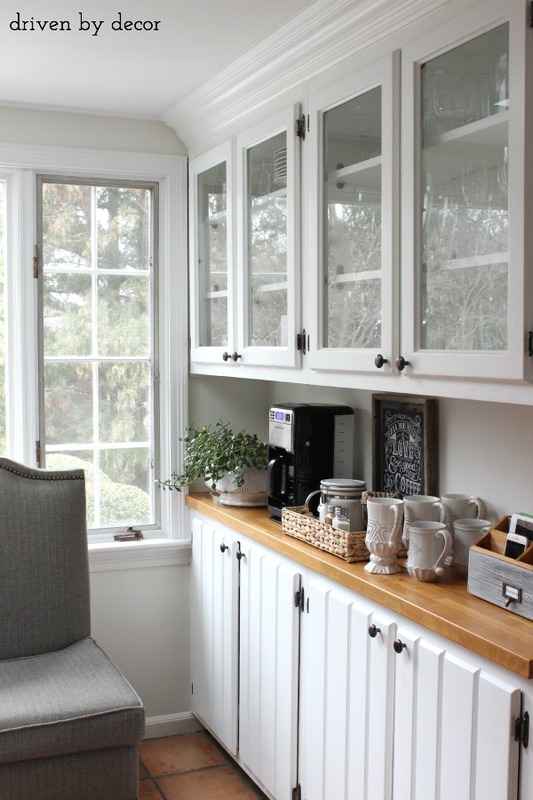 Some months ago, Kris at Driven by Decor revealed her coffee station. I thought it was a great idea, and I've been wanting to put one together ever since. So, I cleared off an accent table in our breakfast area and went to work! I decided to do a Christmas theme for our station. I rounded up some items starting with this runner that Denise, one of my dearest friends in the world, gave me years ago. Next, I dug out my old red tray from Kirklands to hold everything. If you don't have a tray, a basket would work. Kris used a basket in her station. I was worried that the coffee pot cord wouldn't reach the outlet, but luckily it did. Then, I added a talking sign from last year. I emptied the glass container holding my cotton balls and used it to hold the coffee. I found some left over ribbon in a drawer and tied it on. Now, for the fixings. My mom gave me this small ceramic gift box moons ago, and I used a small gold box I've had for twenty years that also looks like a gift. Perfect for holding the sweetener. And, voila! A fun, new coffee station for the holidays. I hope you're having a great week and not too stressed out from getting ready for the holidays.